Steller's Jays seem to have split personalities. On one hand, they can be very shy and quiet. Often, when I glance at one, even from a great distance, they will move behind a trunk or hop up into the canopy. Sometimes, they will immediately fly away. On the other hand, they can occasionally be very loud, raucous and unintimidated by my presence. 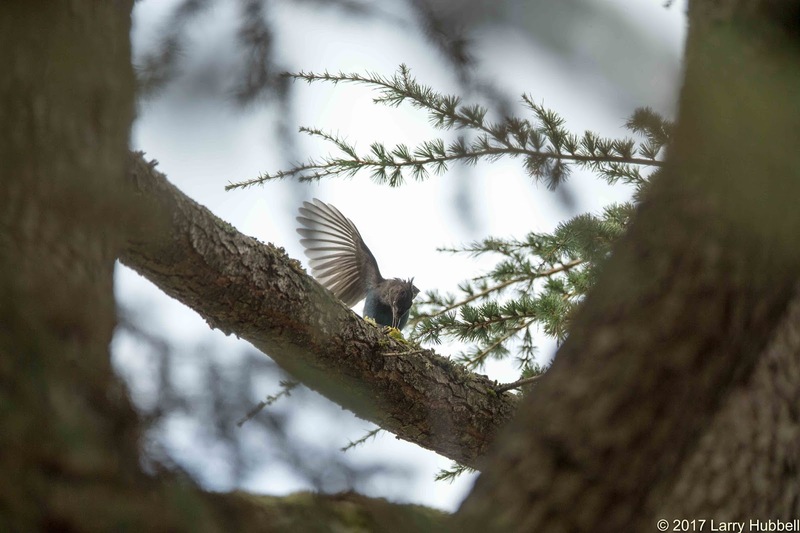 My friend Dan Reiff says when they are being extremely shy it is usually a sign that they are nesting nearby. During the early portion of their first year they are a bit less flashy. Some of their feathers tend to have a dishwater-brown cast. Of course, these will ultimately be replaced with beautiful black feathers. 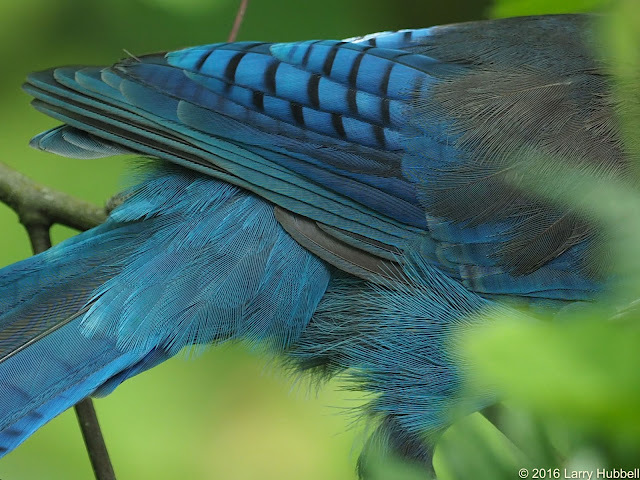 In the meantime, the rapidly molting brown feathers do not stop the jays from worrying about their appearance or cleanliness. Even at a young age they enjoy bathing. 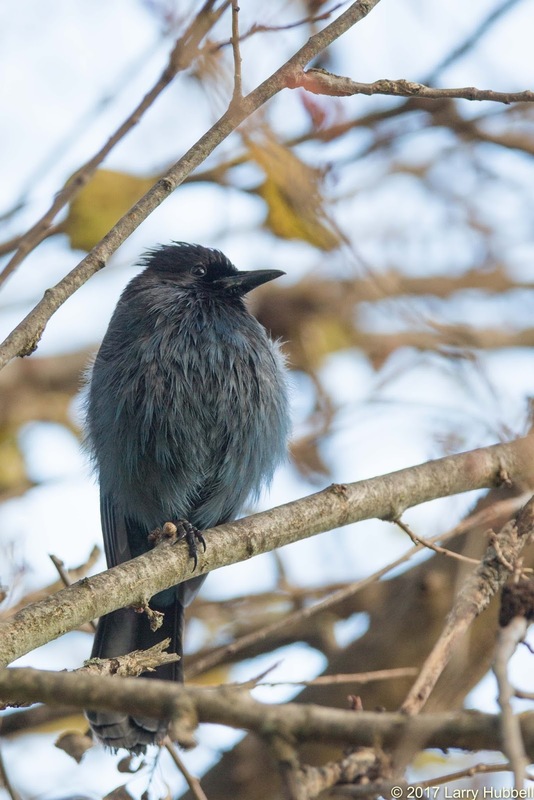 By September when this photo was taken, the brown feathers have all been replaced. The reddish-pink color inside the mouth is one of the last clues left to the age of this first year bird. Also, its crest will most likely be a bit longer when it fully matures. If I understand correctly, in mature birds an erect crest generally indicates elevated anxiety or some sort of arousal. Logically, a lowered crest must imply peacefulness or calm. Last week, I spotted this bird sitting beside Duck Bay. For the longest time it simply sat in the sun directly in front of me. When it did the super-fluff feather expansion, I realized it was completely unconcerned with me or my daughter's dog, Ginger. I must admit that due to Ginger's personality, and many years of birding experience, she is exceptionally quiet, especially when compared with the average dog. 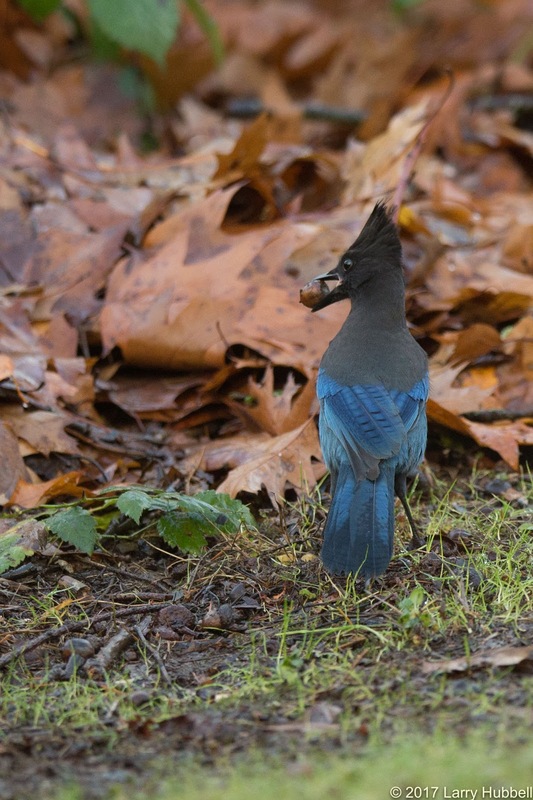 The jay continued to ignore us while it carefully evaluated a potential overhead threat. In the end, it finally roused itself and flew over to Nest Egg Island. Note: This is the same bird that was in the previous three photos. I find the difference in its appearance surprising. 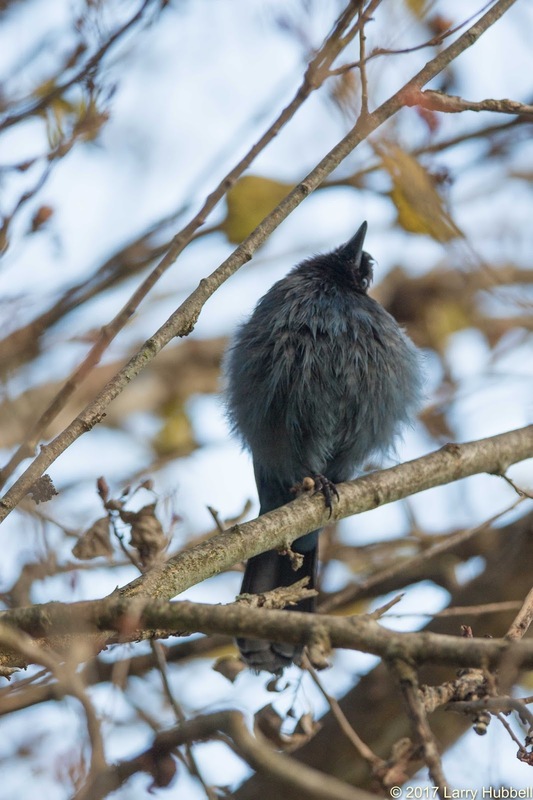 I have not yet encountered the photo opportunity of my fantasies - as related to Steller's Jays. However, this photo is a step in the right direction. 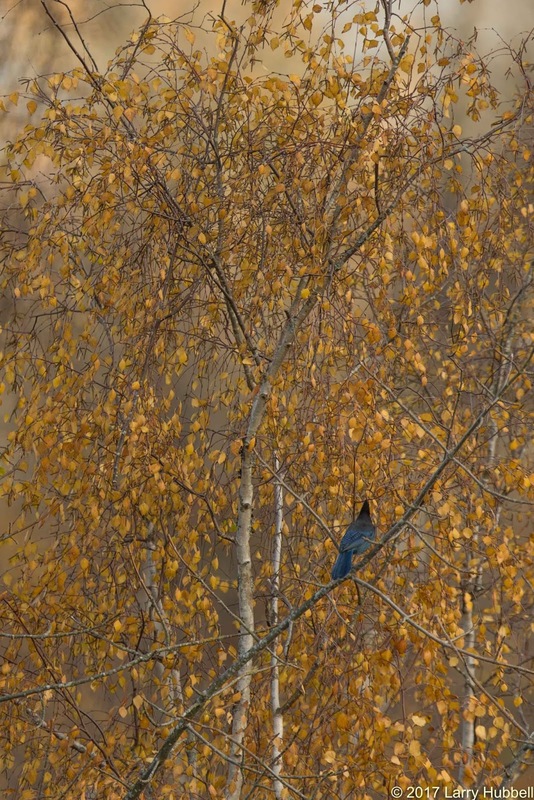 I dream of bright yellow leaves in the background and a brilliantly blue bird perfectly focused in the foreground. This photo would be much closer to the dream if the Indian Plum had retained its full compliment of yellow leaves. 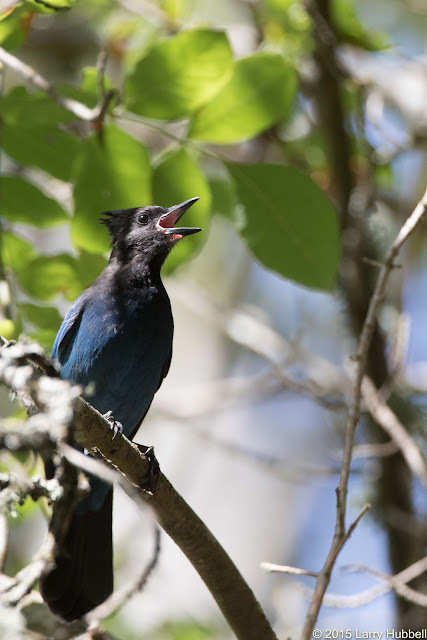 Steller's Jays are quite intelligent. The quizzical way this bird cocked its head certainly implies thoughtfulness to me. I suspect, that just like humans, a bird in thought is often considering its next meal. 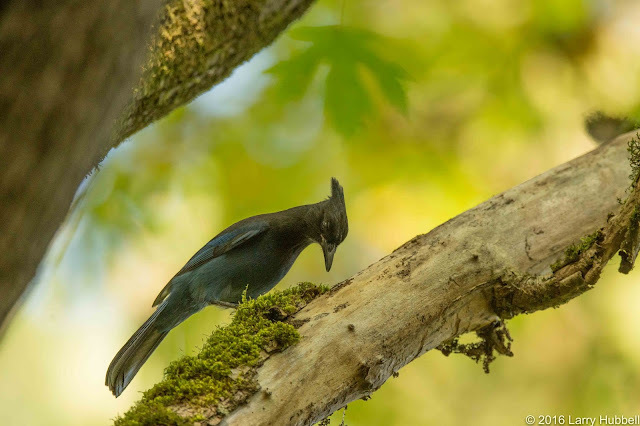 Earlier in the fall I noticed Steller's Jays eating the nuts of a California Laurel, just south of the Sorbus collection in the Arboretum. This jay carried its nut to a nearby coniferous tree with large branches, where it could easily hold the nut while hacking it open. The wing is evidently being used for balance. A week or two ago, I saw the same type of process happening near Duck Bay, at the north end of the Arboretum. This bird is preparing to strike a nut with the full focused force of its beak. On Monday, immediately after a gardner uncovered the lawn on Foster Island with a leaf-blower, I watched the jays come in and collect newly revealed acorns. 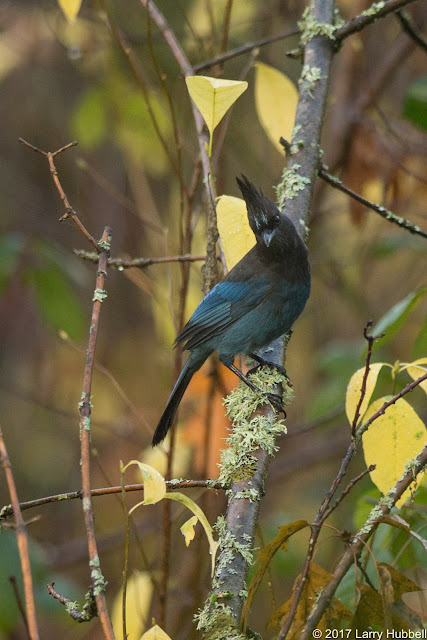 Over the years, I have repeatedly watched Steller's Jays carry their Foster Island acorns west to Nest Egg Island. 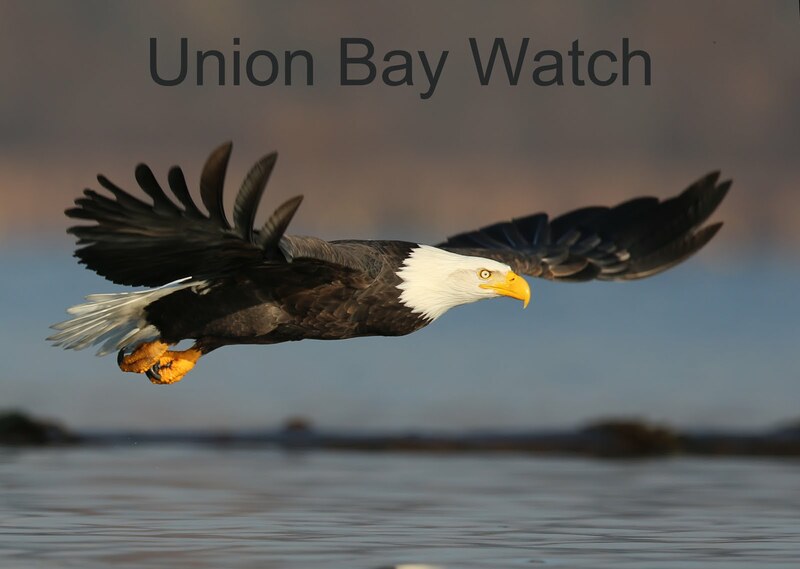 (You can see the exact location by Clicking Here and visiting my personalized map of Union Bay.) I must admit I have been a bit confused about what the jays were doing. 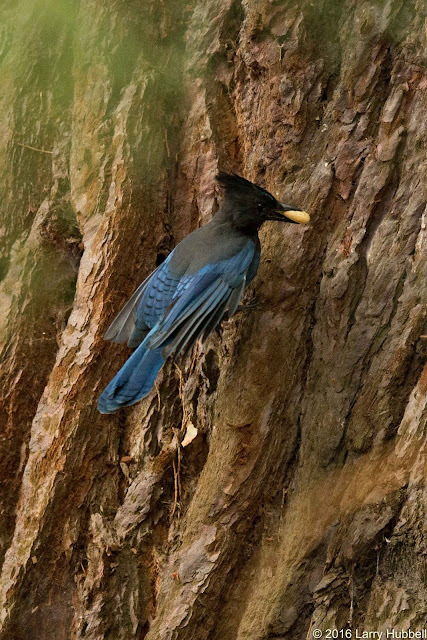 Previously, I have watched jays caching nuts in crevices on large trees in the Arboretum. However, there are no large trees on Nest Egg Island. Last month, while kayaking with Marcus Roening, my original birding mentor, I asked him about the situation. Immediately, he asked if I had ever seen any squirrels on Nest Egg Island. I replied, 'None, that I can remember.' Marcus concluded that the jays were caching the nuts on the island to keep them away from the squirrels. The missing piece to the puzzle for me was the realization that jays will cache nuts in the ground, as well as in trees. 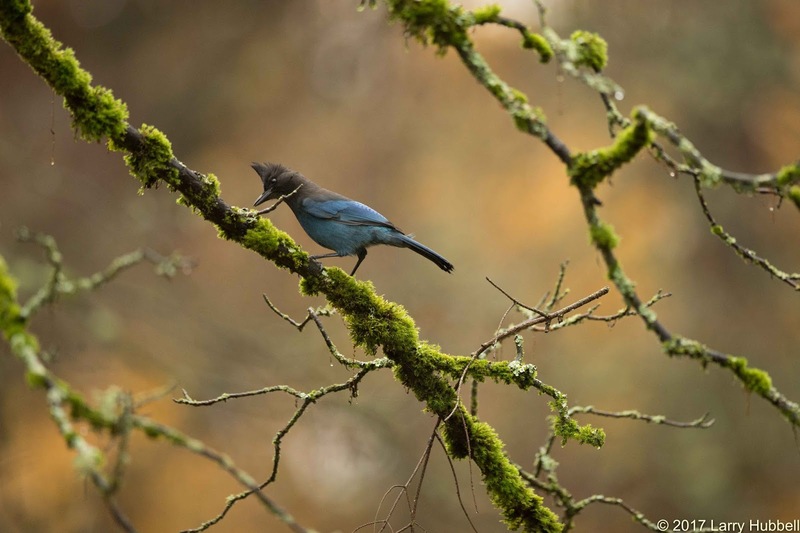 It seems very likely to me that sooner or later a jay will forget where it hid one or more nuts on Nest Egg Island. I expect that someday, the little Island may be covered with oak trees. It will be interesting to watch and see when or if this actually happens. 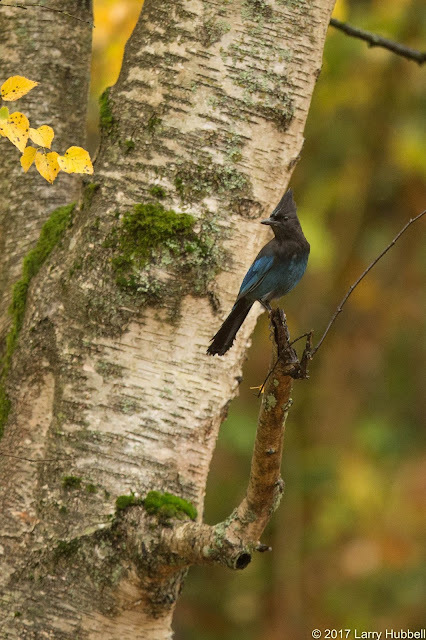 In the mean time, whenever I see a Steller's Jay on a branch I wonder, What is it doing? It may be inspecting the branch for small creatures to eat, retreiving a previously cached nut, hiding a nut for future consumption, or holding a nut that it's preparing to open and eat. In the Spring, it might be inspecting for a potential nest site, looking for the nest of a smaller bird to raid or simply preparing to sit in the sun and enjoy the weather. I am sure there are many other possibilities, which I have not even considered. Who would have guessed that the life of a relatively small and beautiful corvid could be so complex. Without a well-funded Environmental Protection Agency, it falls to each of us to be ever more vigilant in protecting our local environments. Native plants and trees encourage the largest diversity of lifeforms because of their long intertwined history with local, native creatures. I have been told that even the microbes in the soil are native to each local landscape. My hope is that we can inspire ourselves, our neighbors and local businesses to plant native flora and to support native wildlife at every opportunity. My intention is to include at least one photo each week and visually challenge us to know the difference between native and non-native lifeforms. Can you identify these plants? Are they native to Union Bay? 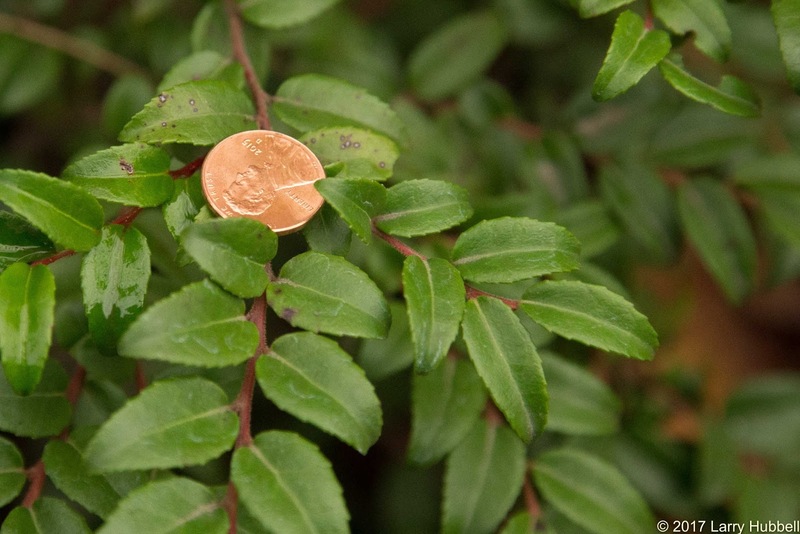 Plant B is our native evergreen huckleberry. 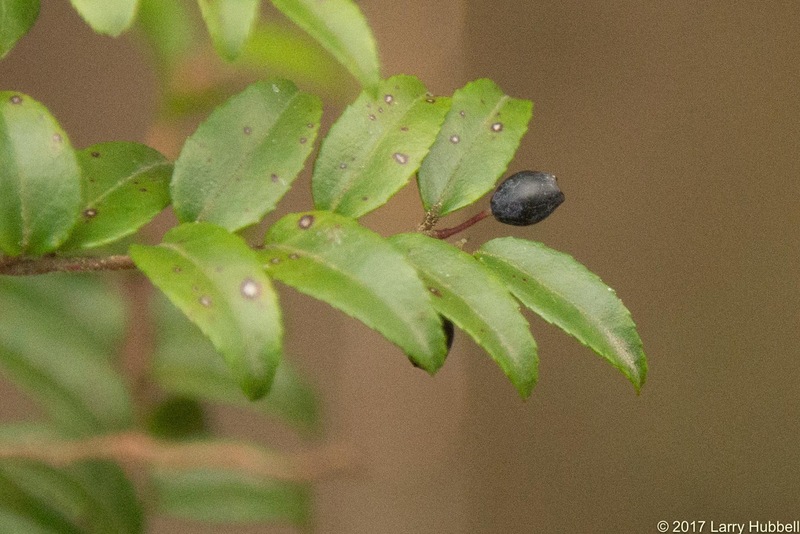 The photo below is an example showing a partially developed berry. Plant A on the other hand is not the same plant. Until a few years ago I mistakenly assumed that it was. When we were replanting our yard our landscape architect informed me that Plant A was from Asia (Japan if a remember correctly). At the time, I thought the leaves and berries looked very similar and even the taste of the berries seemed essentially the same to me. Our architect correctly informed me that I needed to be much more careful about eating berries, especially from plants that I had not correctly identified. The most obvious difference to my eye is the color of the stems or small branches. Our local evergreen huckleberry stems are a reddish-brown color while the stems of the introduced plant are more of a greenish-brown. Now, comparing them side-by-side, I also think the native leaves appear slightly longer and a bit more pointed. I have been unable to locate the correct name for the introduced plant. Feel free to leave a comment below if you know the plant's name. Thank you! 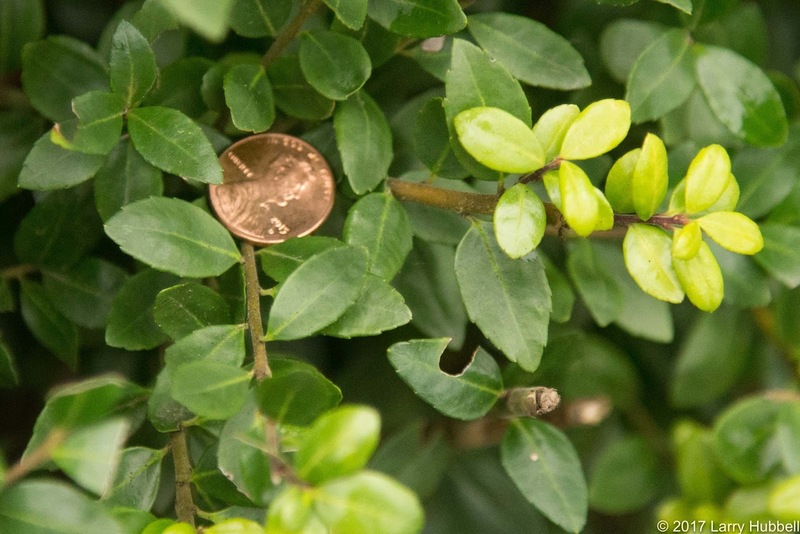 Regarding my unknown plant, David Zuckerman, Manager of Horticulture for the UW Botanic Gardens, identified it as 'ilex crenata'. He informed me that the berries are toxic. Evidently, I should just be glad to still be kicking. With David's guidance I found the following pdf regarding the plant. Thank you, David! Exquisite photography as is your hallmark, and a beautiful writeup about one of the most colorful birds in our winter landscape. I especially love the shot of the Stellers Jay in flight with the acorn -- an incredible photograph. You're quite right about the odd contradiction between their shyness and boldness. A couple of years ago we had a leucistic jay in our yard for a time, so of course I always knew when I was looking at the exact same individual. Thank you! 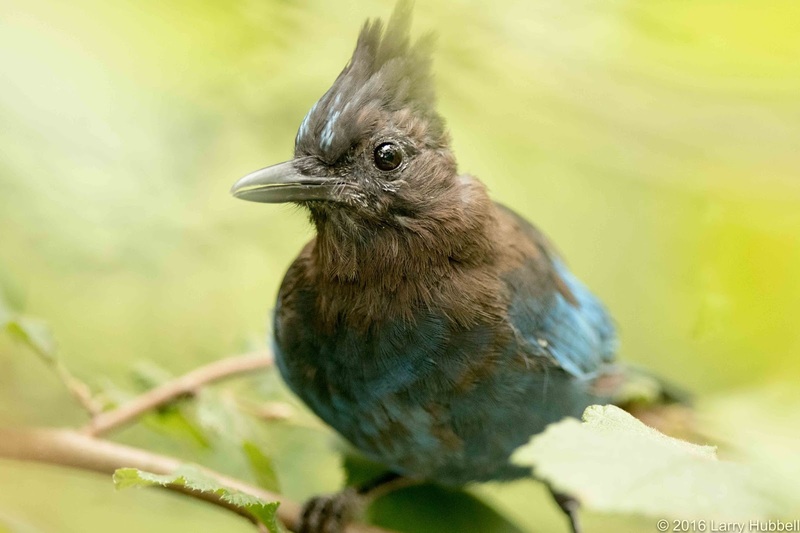 That would be wonderful to be able to identify and watch a particular Steller's Jay. 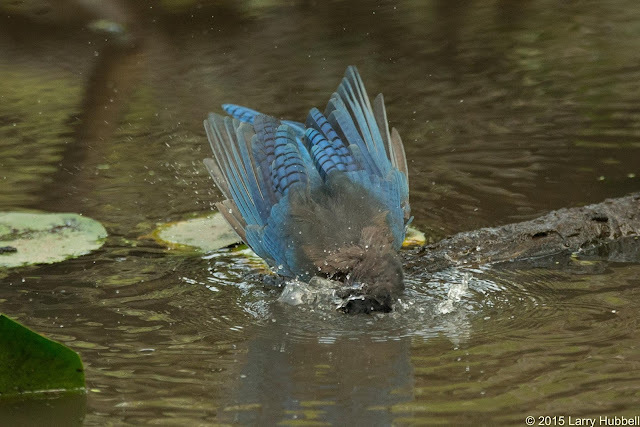 I suppose that a jay with lots of white feathers would have been an irresistible target for predatory birds. 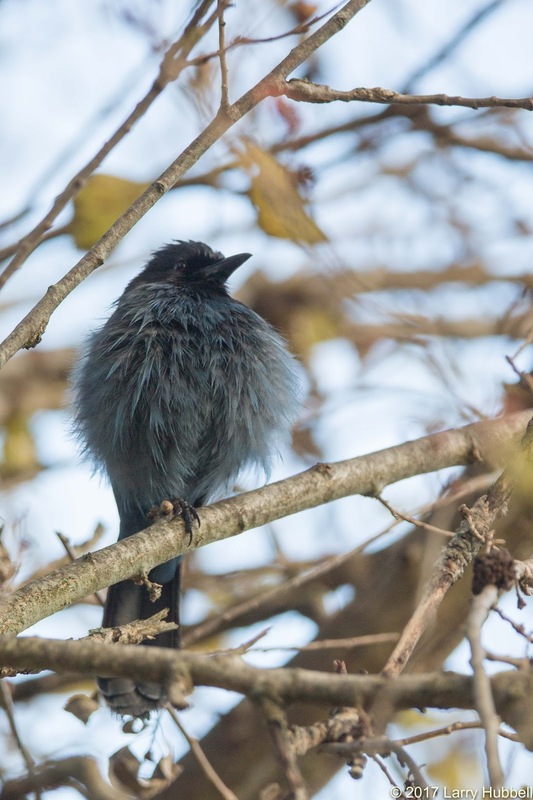 However, it sure would be fun if a subspecies of white jays were able to evolve in our area. I just read a piece about the surprisingly quick creation of a new species. You will need to 'cut and paste' this link into your browser but I think you will find it worth the effort. I lived in Anchorage for 35 years, and we fed raw, in the shell peanuts to our local stellers Jays. We had plenty of red squirrels that also ate the peanuts. The jays would shell and eat some right there at the feeder. Others, they would hide in the mulch of the flowerbeds or in the grass in the yard, putting a leaf over the spot to hide the peanut. Often when we dug in the gardens, flowerbeds or flowerpots, we would come up with peanuts. They never seem concerned that the squirrels would locate their hidden peanuts. Thank you for relating your experience observing jay behavior. That is very interesting. It seems there is always something more to see and learn in the natural world. 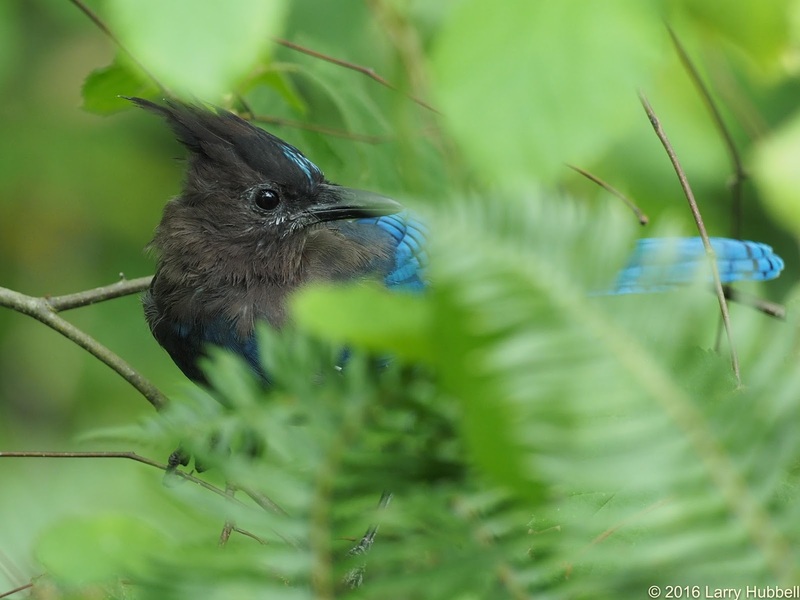 I suppose the actual growth of peanut plants in AK would be a bit farfetched - the jays may have better luck with the eastern oak trees on Nest Egg Island. Thanks for sharing! 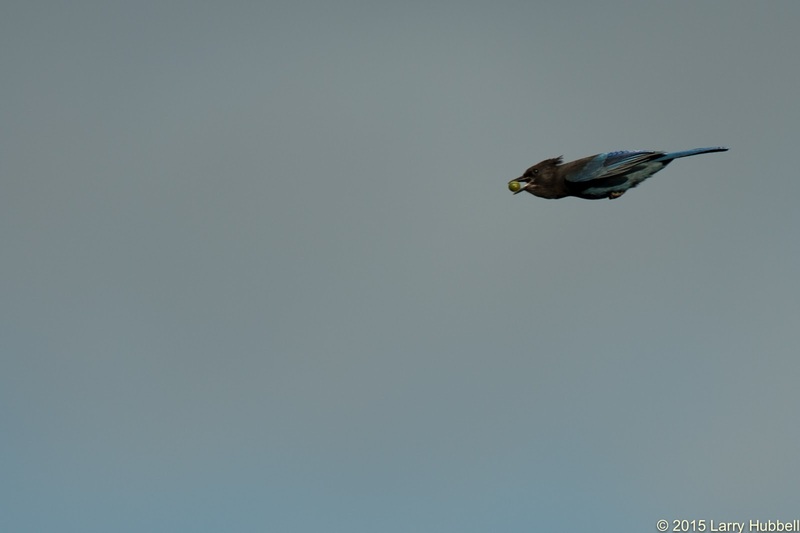 Those Alaskan Jays, so entertaining. They were quite used to having a feeder full of peanuts. When it was empty, they’d travel from window to window, tapping lightly and appearing to look inside until the humans inside brought out more peanuts. I once watched a jay fly in to the peanut feeder, disgorge a crop-full of field corn kernels(from our neighbor’s feeder) on the deck rail, and stuff down a couple peanuts instead. Very interesting! I wonder what this implies about the jays? Obviously, it liked peanuts over corn but was it a choice made based on taste or total energy potential or some other factor I have not even considered. I am a peanut butter fan myself so I have a similar preference. Still, I wish I could read the jay's mind. Thanks for sharing! Thank you! Not only have I stopped eating the berries, I am entertaining the idea of removing the plant.Good Luck - with that dream photo! Thank you, thank you for posting the picture of the juvenile brown Steller Jay. I saw a couple this morning. They looked just like their parents, but were brown. I spent a bit of time on birdweb trying to find out what they were! The closest I came to was a Waxwing... which was not quite it. I even resorted to searching for "seattle looks like brown steller jay"... with no success. 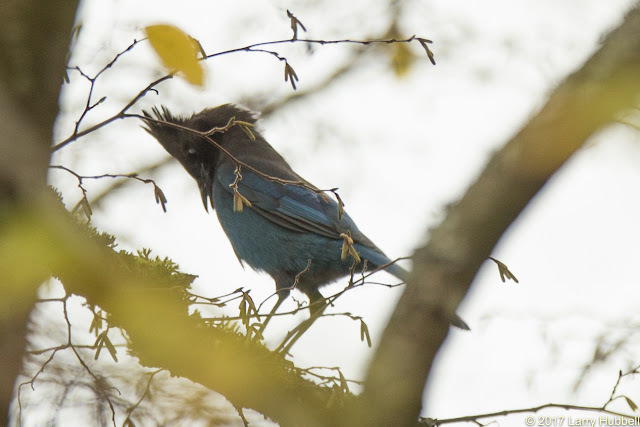 For an explanation, there is a huge oak tree across the street from our house that seems to be a Steller Jay nesting area. They are there all year round... so it is logical to see a dull colored juvenile. But is this the right time of year? 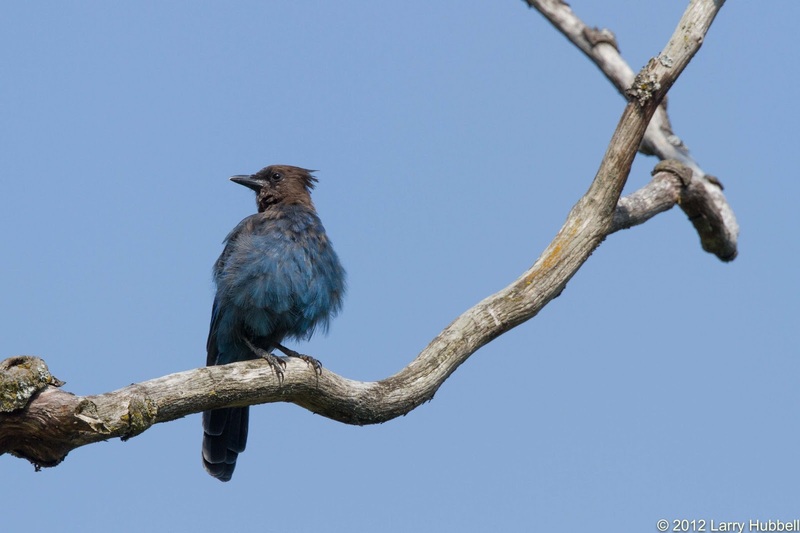 Your time-of-year question prompted me to review the comments regarding Steller's Jays molting in Peter Pyle's, 'Identification Guide to North American Birds', Vol. 1, page 296. He says, 'Hatch Year/Second Year (Sep.-Aug.)..., the retained outer coverts brownish or sooty and worn, contrasting with the markedly bluer inner coverts;...' I understand this to say that from September in their first year through August of their second year the young jays can have some brown feathers. If I have this correct then it means you could literally see some of the younger jays with brown feathers during any month of the year. 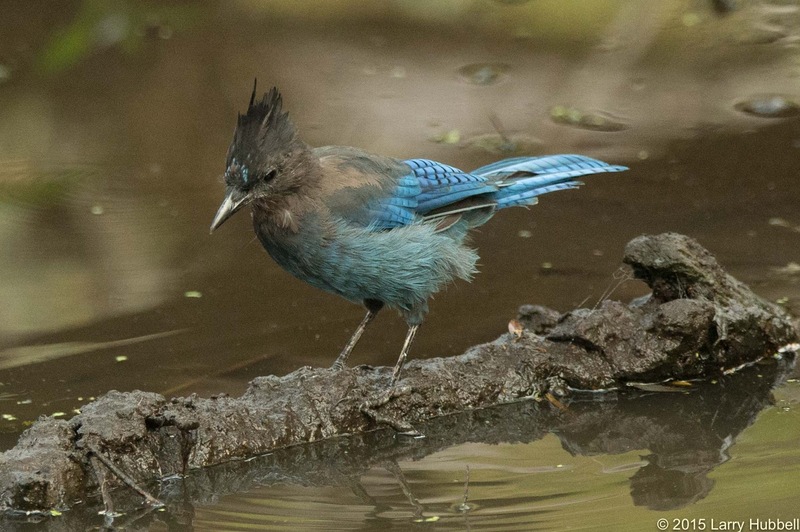 In Birds of North America they mention the young jays being sooty-colored through their first Aug. and then they (BNA) also mention the young birds having some brownish feathers for approximately the next year. They call this 'brownish plumage' their formative plumage. Thank you so much. Unfortunately the web-pages on birds concentrate on adults, and not young birds. Oddly enough just yesterday a young bald eagle flew by my house, close enough that I could tell it was not a red tailed hawk (like right outside my second floor window!). Wow! Congratulations on a great sighting. It is wonderful that we have enough food in the city to support wild creatures. As our city continues to grow wouldn't it be wonderful if we strengthen and increase that habitat for our wild neighbors!